In the Mid-Atlantic region of the United States, state, tribal, and federal governments along with stakeholders are engaged in regional planning to maintain and enhance the health of the ocean and to support sustainable use of the ocean. 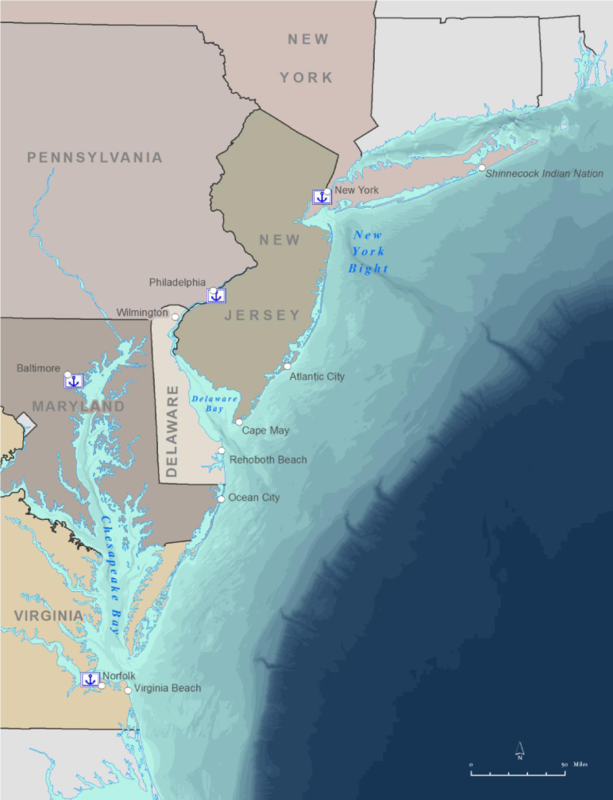 The Mid-Atlantic Regional Ocean Assessment (ROA) is an information resource developed to support the regional planning process. It provides an engaging and reader-friendly distillation of key information on selected topics in ocean planning for decision-makers, stakeholders, and the broader public. The ROA brings together and summarizes best available information on the ocean ecosystem and ocean uses from New York to Virginia, and it serves as a gateway to more in-depth information sources. A Steering Committee with representatives from the Mid-Atlantic Regional Planning Body, Mid-Atlantic Regional Council on the Ocean, and Mid-Atlantic Ocean Data Portal guided the ROA process. The content and structure of the ROA align with the goals and objectives of the Mid-Atlantic Regional Ocean Planning Framework and the Mid-Atlantic Ocean Action Plan. Characterizing the Mid-Atlantic Ocean Ecosystem and Resources provides context for regional ocean planning by giving an overview of Mid-Atlantic geography, oceanography, marine life, human components, and ecosystem changes. Toward Ocean Planning Objectives: Status, Trends, and Linkages focuses on aspects of the ecosystem that relate directly to goals and objectives of the Ocean Action Plan. Characterizing Mid-Atlantic Ocean Uses presents a brief overview of how people use the ocean in the region and of economic activity associated with the ocean. Toward Ocean Planning Objectives: Status, Trends, and Linkages describes major ocean uses related to the Ocean Action Plan and recent and anticipated changes in those uses. Navigating the Regional Ocean Assessment: At the bottom of each page is a Table of Contents with links to all sections. The ocean waters of the Mid-Atlantic, stretching from New York to Virginia, shape the environment, economy, and the culture of the region. For centuries, the ocean has provided food for the table, routes for transportation, places for recreation and relaxation—and much more. Ecologically, the Mid-Atlantic ocean contains diverse habitats that support numerous fish and seabird species, rare deep-sea corals, imperiled marine mammals, and many other types of marine life. Yet today the Mid-Atlantic ocean is changing dramatically, the human population is growing, and the ways in which people use the ocean are evolving and expanding quickly. Planning for those changes can help resource management and policy efforts to be effective, leading to improved ocean health and greater benefits for society. What Lies Ahead for the Mid-Atlantic Ocean? The following are examples of changes that are anticipated to occur in the next 20 years and that have implications for regional ocean planning. The National Ocean Policy establishes a framework for people of the United States to conduct ocean planning toward a healthy marine ecosystem and sustainable use of the ocean. Ocean planning is a science- and information-based process that can help advance local and regional interests. To develop regional ocean plans, representatives from multiple levels of government work together, publicly and transparently, as a regional planning body. Their work is informed by the expertise and perspectives of stakeholders whose participation ensures that the planning is based on a full understanding of the range of interests and interactions in each region. Under the National Ocean Plan, the scope, scale, and content of ocean plans are defined by the people in the regions themselves—to address shared regional priorities in ways that reflect their unique interests, capacity to participate, and ways of doing business. The Mid-Atlantic Regional Planning Body (RPB) leads a collaborative process to implement ocean planning. It comprises representatives from eight federal agencies with ocean interests1, six Mid-Atlantic states (New York, New Jersey, Pennsylvania, Delaware, Maryland, Virginia), three federally recognized tribes (Shinnecock Indian Nation, Oneida Indian Nation, Pamunkey Indian Tribe), and the Mid-Atlantic Fisheries Management Council. The Mid-Atlantic RPB receives support from the Mid-Atlantic Regional Council on the Ocean (MARCO), a partnership formed in 2009 by the governors of New York, New Jersey, Delaware, Maryland, and Virginia. 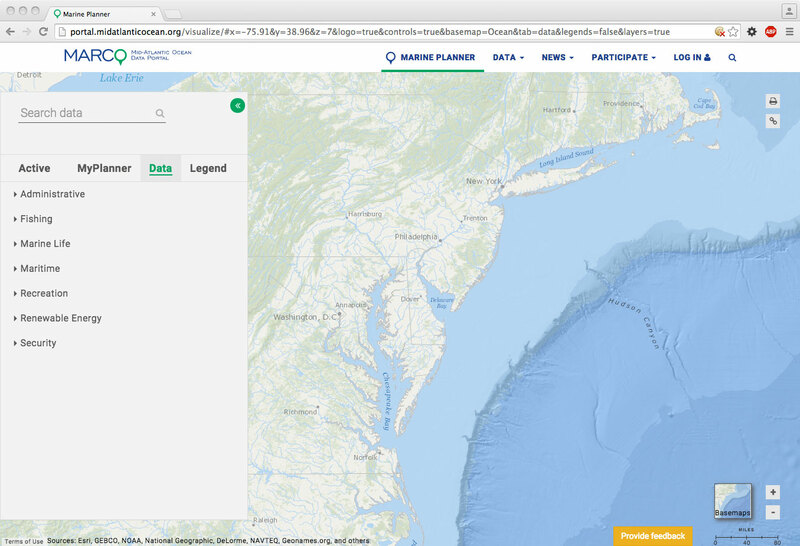 The RPB’s work and this Regional Ocean Assessment are also informed by the Mid-Atlantic Ocean Data Portal, an interactive mapping site that is updated regularly with data on the region’s marine ecology and the ways people use and interact with the ocean. The Mid-Atlantic Ocean Data Portal supports regional ocean planning by providing data on the ocean ecosystem and ocean uses. The Mid-Atlantic RPB initiated the regional ocean planning process in 2013 and will release a draft Ocean Action Plan for public comment in mid-2016. The RPB will submit the final Ocean Action Plan to the National Ocean Council in late 2016. Non-government organizations, educational institutions, fishermen, industry representatives, and the public are all important stakeholders and are integral to the planning effort. The Mid-Atlantic RPB seeks to incorporate traditional knowledge and values from tribes, fishermen, and many others who can provide historical, ecological, cultural and economic context and contribute to a shared understanding of ocean and coastal sites. Healthy Ocean Ecosystem: Promote ocean ecosystem health, functionality and integrity through conservation, protection, enhancement, and restoration. Sustainable Ocean Uses: Plan and provide for existing and emerging ocean uses in a sustainable manner that minimizes conflicts, improves effectiveness and regulatory predictability, and supports economic growth. The two sections of the Regional Ocean Assessment — Ocean Ecosystem and Resources and Ocean Uses — inform efforts to achieve those interrelated goals. 1 The eight federal agencies represented on the Mid-Atlantic Regional Planning Body are the Department of Agriculture (represented by the Natural Resources Conservation Service), Department of Commerce (represented by the National Oceanic and Atmospheric Administration), Department of Defense and the Joint Chiefs of Staff (represented by the U.S. Navy), Department of Energy (represented by Energy Efficiency & Renewable Energy), Department of Homeland Security (represented by the U.S. Coast Guard), Department of the Interior (represented by the Bureau of Ocean Energy Management), Department of Transportation (represented by the Maritime Administration), and Environmental Protection Agency.